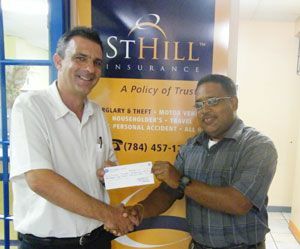 Raymond Durrant, Claims Manager of the St. Hill insurance Company, handed over a cheque valued at EC$1863, to Principal John Renton at the companyâs offices in Kingstown to help in preparation for the schoolâs annual inter-house athletics meet, which takes place on Thursday, March 3. Renton indicated that the cheque will go towards the purchase of trophies, and other expenses that will be incurred. Renton thanked the management of St. Hill Insurance for the gesture, which he said comes close to half of the schoolâs expenses for the dayâs event, which is scheduled to be held at the Victoria Park. He said that the school appreciates the assistance that it has been receiving over the years from St. Hill Insurance, which he considers a friend of the school. Durrant, in handing over the cheque, confirmed that his company remains committed to the school, which it adopted a few years ago. He noted that they intend to continue to offer assistance to the school as it fulfills its corporate sponsorship duties. Incidentally, St. Hill House, one of the houses that will be in action on March 3, is currently out front in the competitionâs points standings.